Kurt leaves his work commute to Metro Transit, which allows him to enjoy some time to himself in the morning and in the evening without the stress of traffic or searching for a parking spot. Kurt drives from his home in Chesterfield to the Ballas Transit Center in Town & Country. He parks at the free Park-Ride lot and boards the #57X Clayton Rd, which brings him to the Brentwood I-64 MetroLink Station. From there, he hops on a Blue Line train and rides to the University City-Big Bend MetroLink Station. It’s a short walk from the station to his work at Washington University. 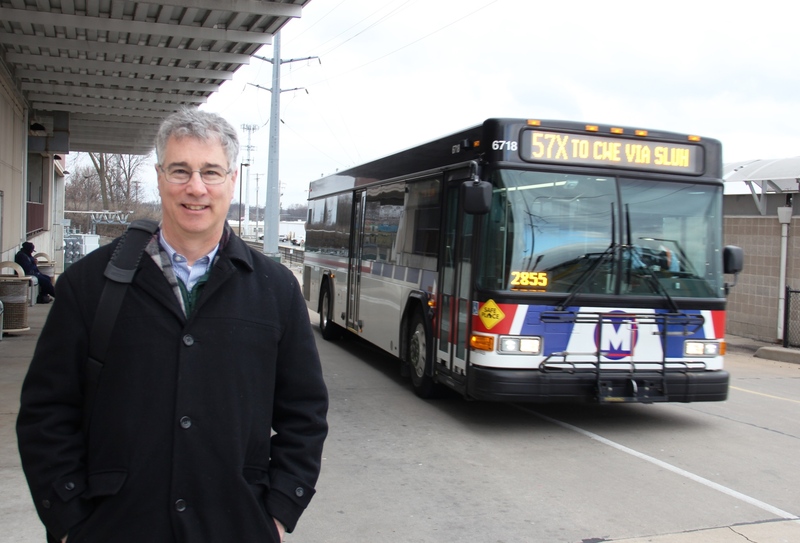 When Kurt started working at Washington University, it became an opportunity for him to discover all of the benefits Metro offers. But, before boarding a bus or train, Kurt did his research. He charted out a plan and made sure it fit his lifestyle. “It ended up being an easy decision to get on a bus,” he said. Since putting his transit commute into full gear, Kurt has made a few modifications to his original commute to maximize his time. Through this experience, Kurt has cultivated a better idea of the transit system around where he works and lives. He also has a few tricks – both low-tech and high-tech – to keep him on track.